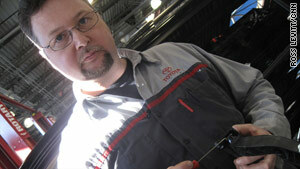 Mike Gaige of Parkway Toyota in Englewood Cliffs, New Jersey, shows where parts will go to fix Toyota accelerators. (CNN) -- As Toyota recalls millions of cars, the National Highway Traffic Safety Administration reports that an average of 25 percent of U.S. consumers who get recall notices don't follow through and fix their vehicles. The CNN Fact Check Desk wondered: Is there a way to ensure compliance with auto recalls? Most vehicle recalls involve free fixes for the consumer. • Clarence Ditlow with the Center for Auto Safety, a consumer watchdog group, says there is not a process to ensure that auto owners comply with recalls. The center says vehicle insurers have an incentive and a method to reach car owners who haven't complied fully with recalls. "Insurers have the VIN [vehicle identification numbers], and they could contact the insured drivers who have failed to comply," Ditlow says. Because states are responsible for issuing a vehicle's registration, Ditlow sees an opportunity for state governments to force compliance. He says that states could refuse to renew registration until the manufacturer's fix has been made. However, he says, no states have taken this step so far. • According to Edmunds.com, some states do require owners to make the requisite repairs before they attempt to sell the affected car. • Jeanne Salvatore, with the Insurance Information Institute, says that auto insurers will pay damage claims caused by the current Toyota defects, then go after Toyota for reimbursements. • CNN Personal Finance Editor Gerri Willis says that new car dealers are prevented from selling a defective car. • If recall communications are deemed insufficient, the NHTSA can require further efforts from the manufacturer. But there is not a mechanism at the federal level to ensure that drivers comply. • Bottom line: If the NHTSA's 25 percent noncompliance figure is any indication, there could be many affected Toyota models that do not get the requisite fix under the current recall. Although there have been suggestions for how to better enforce recalls, there is no mechanism in place to force drivers to make the change. CNN's Jen Haley and CNNMoney's Peter Valdes-Dapena contributed to this report.